With its charming jumble of fishing boats and fishermen’s cabins clustered around the small harbor, and framed by the arches of a stone-brick bridge; visiting Vallon des Auffes feels like stepping back in time. Located along the Marseille Corniche, the historic port village is a world away from the bustling city and makes a tranquil detour for those traveling along the coastal road. Despite its diminutive size, Vallon des Auffes punches well above its weight when it comes to gastronomy and its handful of waterfront restaurants are well known for serving delicious fresh fish and seafood. Top restaurants include Chez Fonfon, L’Epuisette and Chez Jeannot, while the most celebrated dish is Provencal specialty bouillabaisse. Vallon des Auffes is located in Marseille’s 7th arrondissement, just south of the city center. Spend your time in port in Marseille exploring with ease by electric bike on this 4-hour cycling tour. Spin through the city streets with a guide, and discover top attractions such as Notre Dame de la Garde basilica and the Palais du Pharo. Enjoy panoramic French Riviera views along the pretty Corniche Kennedy, and visit traditional ports including the Vallon des Auffes. Along the way, explore the ancient Panier neighborhood and new Joliette district, and gain insight into centuries of centuries of rich maritime history. Cruise the history-filled streets of Marseille during this fun and informative bus ride. If a sight catches your eye, then hop down and explore—you'll have unlimited opportunities to hop back on. Perfect for first-time visitors, the tour covers 14 different stops, from the Old Port to the castle that inspired The Count of Monte Cristo. Learn about each attraction with an onboard audio guide, available in 8 different languages. Discover the beauty and culture of historic Marseille on this family-friendly electric bike tour! Over two hours and a half or three hours and a half, accompany your guide and small group on a ride through Marseille’s ancient streets. Explore off-the-beaten-path corners of the city, picturesque ports and main attractions like Palais du Pharo and Notre-Dame de la Garde, and cruise along the waterfront for gorgeous Mediterranean views. See more of France’s oldest city with ease! Experience the beauty and culture of France’s oldest city on a 4-hour electric bike tour! On this private Marseille shore excursion, accompany your local guide on a journey through the city’s colorful streets. Explore off-the-beaten-path areas, picturesque ports and main attractions like Palais du Pharo and Notre-Dame de la Garde, then cruise along the waterfront for postcard-perfect Mediterranean views. Maximize your sightseeing time in Marseille! Discover the remarkable beauty of France’s Mediterranean coast on a full-day electric bike tour! This unique outdoor excursion takes you to lovely ports and fishing villages like Madrague Montredon and Vallon des Auffes and through dramatic calanques-filled coves. Along the way, stop to swim and have lunch.Then head back to Marseille for a tour of great sites such as Notre-Dame de la Garde basilica. Cruise along scenic coastline on a fat e-bike. Hop on your wide-tired electric bike and discover monuments like Pharo Palace, fishing village Vallon des Auffes, and the natural beauty of Calanques National Park. Visit a multitude of sights over the course of 6 hours, with plenty of time for photo breaks, a swim, and a delicious seafood lunch. Spend your time in port in Marseille exploring the city with ease on this 6-hour electric bike tour. Hop into the saddle at the port and head to top city attractions including the Notre Dame de la Garde basilica and Pharo Palace. Ride from the Vallon des Auffes to quiet coves along the Corniche Kennedy, and perhaps stop for a swim along the way. Capture sweeping coastal views on camera, and delve into the bustling Joliette district — now a popular hot spot of culture and the Arts. Discover the coastal sights of Marseille without breaking a sweat on a 3- to 4-hour fat e-bike tour. Highlights along the seaside route include the Palais du Pharo, Plages du Prado, and the fishing village of Vallon des Auffes. Thanks to its electric motor and wide set tires, the e-bike is easy to ride. Trailers for small children are provided free of charge, which makes the tour perfect for all ages. Cruise through Marseille’s Old Town on a fat e-bike. This electric bicycle with its distinctive wide tires allows you to cover distance with ease as you explore the city’s historic district. Visit major sights like the Pharo Palace, MuCEM Museum, and Cathedral, as well as lesser-known treasures in Le Panier. Enjoy breaks to take photos and chat with your local guide. After crossing the colorful little streets of a typical Provencal neighborhood and an idyllic path by the sea, you will dive into the waters of the Mediterranean to discover the species that live there. You will find yourself facing nature, in the middle of the sea to carry out an activity whose ecological impact will be minimal. On the route, urban interventions, caves, special ecosystems and a great diversity of fauna and flora are mixed. Physical challenges will surprise the most daring. Your body and your mind will be grateful for a relaxing and sporting activity in which your sensitivity for the sea and nature will be strengthened. Weather conditions will determine our course. Spend a day riding along the breathtaking Mediterranean coast on this electric bike tour from Marseille. Pedal with ease to the city’s southern outskirts and down to the region’s famous ‘calanques,’ dubbed the ‘fjords of the French Riviera.’ Pause at picturesque seaside villages to swim, have lunch. Visit Vallon des Auffes, Les Goudes, Callelongue Cove and more, and end back in Marseille to visit Basilique Notre Dame de la Garde, overlooking the colorful Old Port. 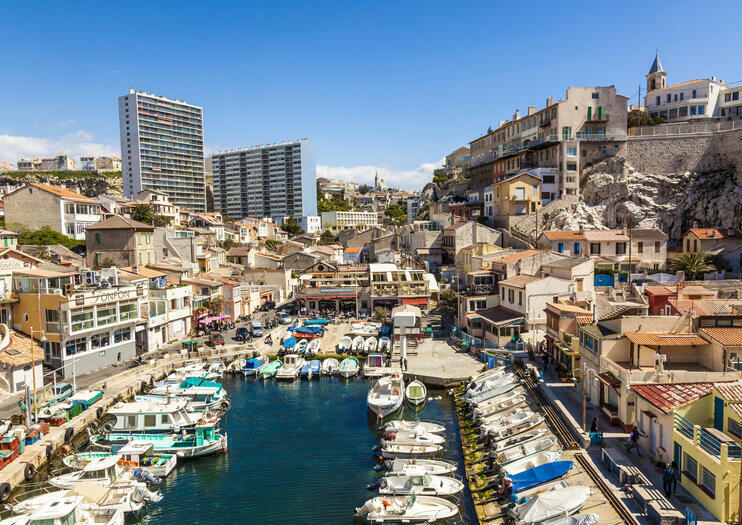 Tour summary - Marseille discover the three secret little portsExplore fishermen's cottages, brightly coloured fishing boats in a setting unchanged for centuries, a stones throw from the city centre. Vallons des Auffes, Malmousque & l'anse de la Fausse Monnaie. A coastal walk between the three little ports with exceptional views. HighlightsWander & discover the hidden tiny 18th century fishing ports and fisherman’s houses. Visit small streets and follow the coastal path to discover this unique neighbourhood. Enjoy the surroundings of life below the Corniche Kennedy & discover architectural gems from the last century and today’s modernist architecture. Experience the history and ancient fishing culture of this colourful Mediterranean city.